Chuck and Scott Veliz in 2015. It would be an enormous understatement to say that coaching football is an incredibly tough profession. We always take too much blame when we lose and we get too much credit when we win. Yes, it can be an extremely rewarding job, but it is also a thankless one as well. It is long hours, it is tough conditions, it is unhappy parents, and it is a what-have-you-done-for-me-lately fan base. What leads us to a profession like this? I believe it is a true calling. I’ve seen many coaches who get into the profession because they played or they love the game, end up leaving within a few years because the grind just is not for them. All of us hit a wall or encounter some sort of adversity at some point (I touched on mine in last week’s blog). But. the thing that gets us were we want to be, the thing that makes us whole are mentors. Good coaching mentors are the difference between a successful career and an unsuccessful one; between a long happy career and a miserable short one. I owe the success I’ve had to many different head coaches I’ve worked for: Tom Work, a great man in the El Paso Athletic Hall of Fame who I played for and who gave me my first job; Ron Durkes, who gave me my first varsity job; Phil Barrios, who gave me my first offensive coordinator job and Jim Althoff, who gave me my last offensive coordinator job and showed me how to lead a successful program; many of the things I do today, like practice schedule and program structure, I got from him. Without those four I’m not where I am today. But there is one person that made such an impact that if it wasn’t for him, I’m doing something else with my life and not writing this blog. My big brother Chuck Veliz retired from coaching and teaching a year-and-half ago as one of the most successful football coaches in El Paso, Texas history. He was so successful in fact, that Sean Kugler, the head coach of UTEP, offered him the WR position with the Miners. Of course he took the job. Chuck was one of those guys that did well at everything he tried. He was an exceptional athlete in high school, got his degree quickly, and started coaching at 22. He got his first head coaching job at the age of 34 for a team that was 0-10 the year before and never did better than 5-5 in their history. All he did was win a district title in his second year and turn them into a West Texas power by his 4th year. He then took over El Paso Montwood, a 6A school that had some talent, but not many wins in their history. All he did was make the playoffs in his first year and win district his second year. 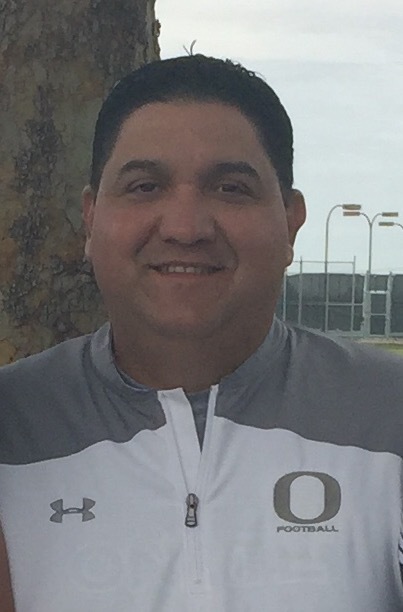 By the time he retired, Montwood was a perennial West Texas power with multiple championships. Not exactly an easy act to follow! As a matter of fact, my junior year of high school my mind was made up that I was going to be a lawyer. I would definitely be making a lot more money right now. Nah, who am I kidding, I would probably still be in law school! Chuck was the one who guided me into the profession. He helped get me my first job at EP Riverside where we worked together for six years and up until these last two years every time I applied for a head job, that dude was working the phones and calling everyone he could to give me a plug. He was a guy I tried to emulate so much when I was younger and when he became a teacher and coach, it was a no-brainer that I had to also. Being eight years older than me, Chuck has more than just a big brother, he was like another Dad. He coached me in little league, he looked out for me, and he drove me crazy! As I got older our relationship evolved from big brother-little brother to true friends. Yes, there have been many times in the past where we’ve wanted to kill each other, but there is nothing on this planet we wouldn’t do for one another. That was why is was so special to face him when I was the OC at EP Eastwood and EP El Dorado and he was the head coach at EP Montwood. Big brother won in 2013, 21-0, but little brother got revenge in a 2014 overtime game 47-40 and in 2015, 28-0. Those last two were the only times I beat that guy at anything! It used to bother me so much when I was younger and people would compare me to him or even call me “Chuck” by accident. Now, I consider it a damn honor when they do! That guy taught me how to lead young men, he taught me how to have a swagger, he taught me how to be a winner; and most importantly he taught me the value of character and instilling values in the young men we coach. There are a lot of things I would want for my two sons, but the number one thing would have to be for them to have a relationship with each other as adults that Chuck and I have now. I have five other brothers and a sister and I am extremely close to all of them and have great relationships with all of them. However, Chuck’s and mine is a bit different…sure we have the family bond, the brother bond, but we also have the football bond. Those are bonds that are all near impossible to break.